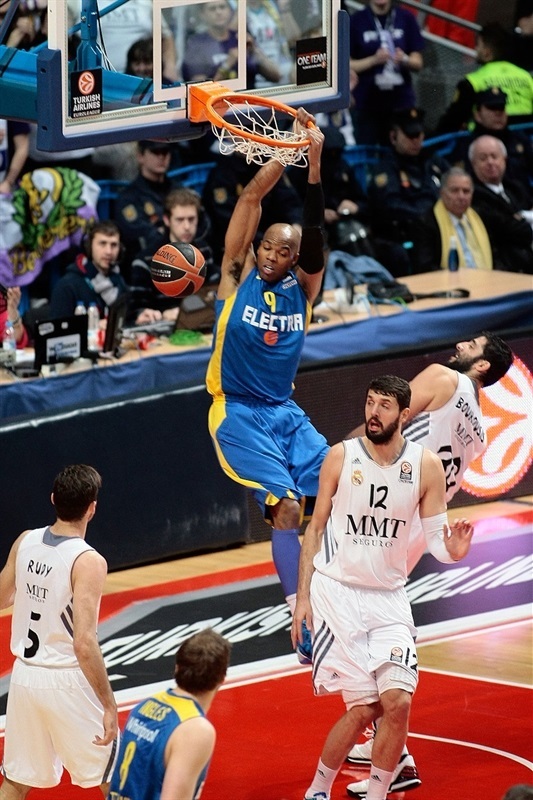 In an intense battle between Turkish Airlines Euroleague classics, Real Madrid improved to 4-1 in Top 16 Group F by edging previously undefeated Maccabi Electra Tel Aviv 74-68 in the Spanish capital on Thursday. Madrid and Maccabi join a three-way tie with CSKA Moscow for first place in Group F, each with a 4-1 record. 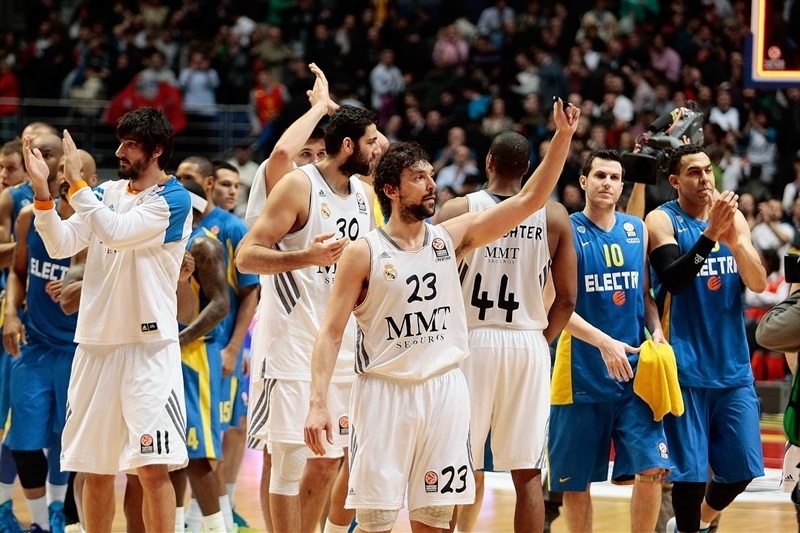 Sergio Llull paced the winners with 20 points, including Madrid's last 8 in the final 100 seconds. 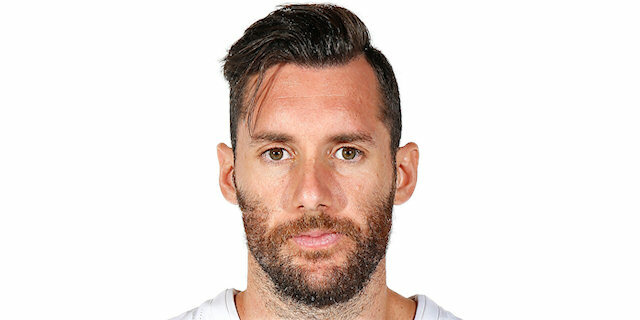 Rudy Fernandez added 16 points and 8 rebounds for Madrid. Sofoklis Schortsanitis and Guy Pnini led Maccabi with 15 points apiece. Ricky Hickman added 11 for the guests. 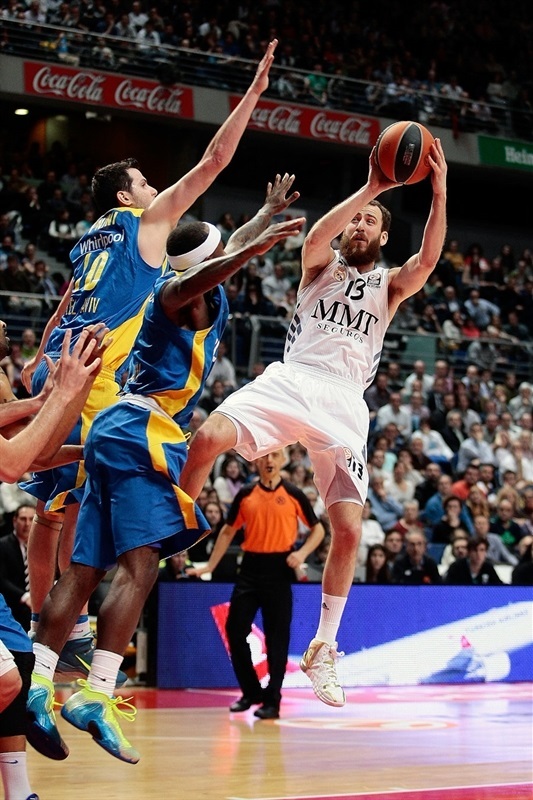 Nikola Mirotic and Fernandez shined early to give Madrid a 16-8 lead. An unstoppable Schortsanitis and a three-pointer by Joe Ingles allowed Maccabi to get a 19-20 edge after 10 minutes. 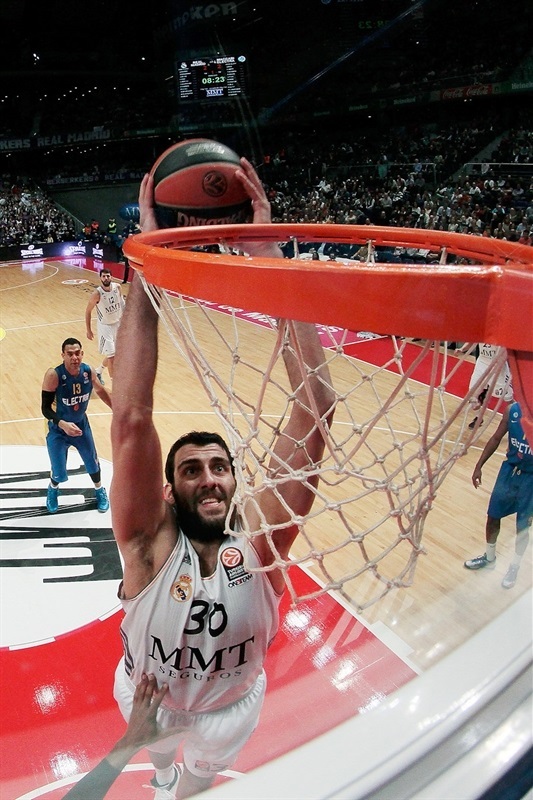 Madrid improved its defense, as Llull and Felipe Reyes gave the hosts to get a 39-35 edge at halftime. Pnini took over after the break, getting help from Devin Smith and Hickman for a 56-57 Maccabi lead through three quarters. 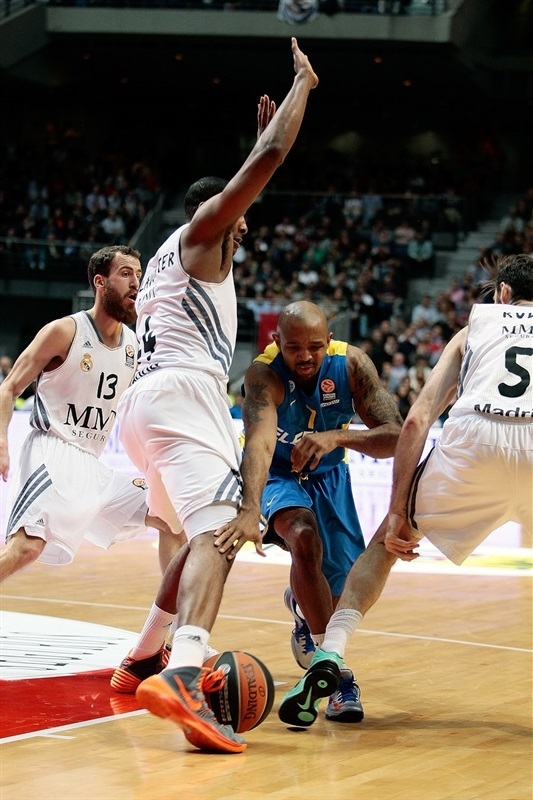 Schortsanitis and Tyrese Rice gave Maccabi a 64-66 lead with over three minutes left but Llull sank back-to-back three-pointers and soon added free throws to lead Madrid to a very important home win. Yogev Ohayon fed Alex Tyus for a slam to get Maccabi going. Mirotic made free throws and Fernandez found Ioannis Bourousis with a two-handed slam, good for a 4-2 Madrid lead. Maccabi struggled to get Ingles and Smith involved. Tyus stepped up with a wild two-handed slam that Mirotic erased with more foul shots. Tyus kept pacing the guests with a fallaway jumper that Llull bettered with a catch-and-shoot three-pointer, good for a 9-6 Madrid lead. Ingles sank a six-meter shot but Mirotic struck from downtown and Fernandez added consecutive fast break layups for a 16-8 Madrid edge. Ingles tried to change things with a backdoor layup and free throw by Schortsanitis kept Maccabi within 16-11. Schortsanitis shined with a tip-in, but Rudy did better with a wild three-point play. An unstoppable Sofo scored twice in the paint and a three-pointer by Ingles put Maccabi back ahead, 19-20, after 10 minutes. Schortsanitis split free throws after the break and a three-pointer by Darden boosted Madrid's lead to 42-36. Mirotic made free throws, but Pnini answered from downtown and a diving steal by Schortsanitis allowed Smith to bring Maccabi within 44-41. Hickman sank a jumper and a free throw by Schortsanitis tied it at 44-44. Llull beat the guests' zone defense with a driving layup that Pnini improved with another triple to give Maccabi a 46-47 edge. Ohayon joined the three-point shootout and a driving layup by Smith made it 46-52. Rodriguez swished a five-meter jumper but Pnini nailed his fifth three-pointer in as many attempts. 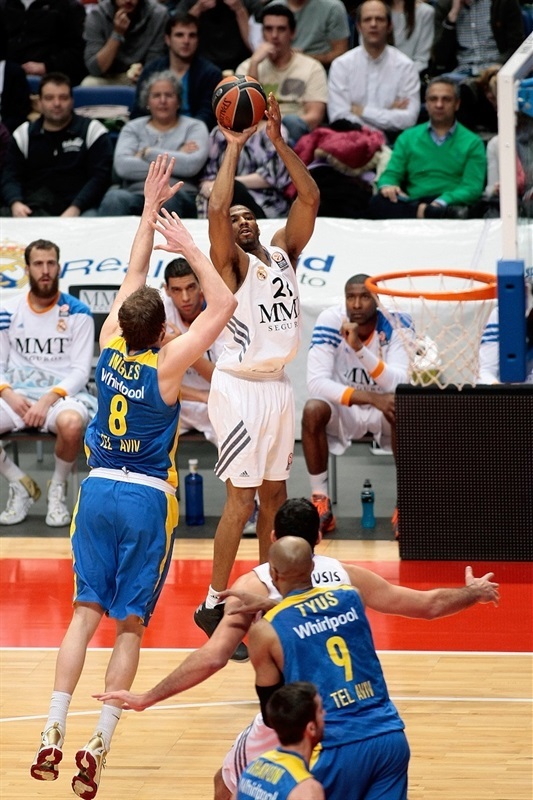 Fernandez scored again and free throws by Rodriguez kept Madrid within 52-55. Hickman stepped up with a big jumper, but Fernandez made 3 of 4 free throws and Reyes split attempts to bring Madrid as close as 56-57 after three quarters. Reyes split free throws early in the fourth quarter. 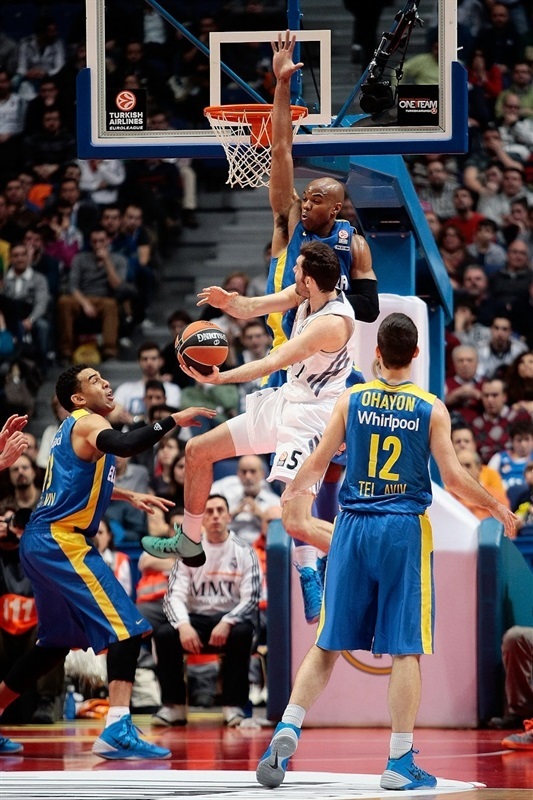 Maccabi was held scoreless for more than two minutes until Schortsanitis found space for a layup. Rudy sent the crowd to its feet with a three-pointer. 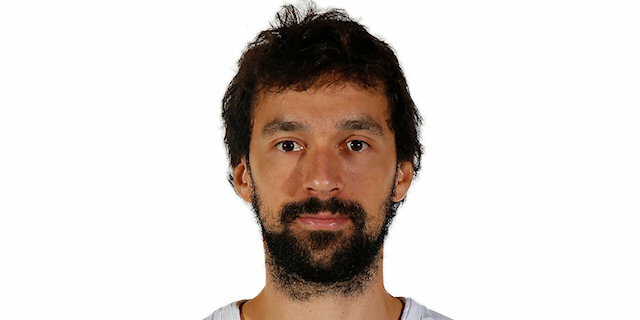 Schortsanitis split free throws and Llull took over with an acrobatic basket – and the free throw that came with it. A free throw by Slaughter made it a 4-point game midway through the fourth quarter. Hickman used a great screen from Schortsanitis to strike from downtown. Free throws by Schortsanitis and Rice allowed Maccabi to regain the lead, 64-66, with over three minutes left. Reyes did not miss from the foul line and a three-pointer by Llull restored a 69-66 Madrid margin with under two minutes to go. 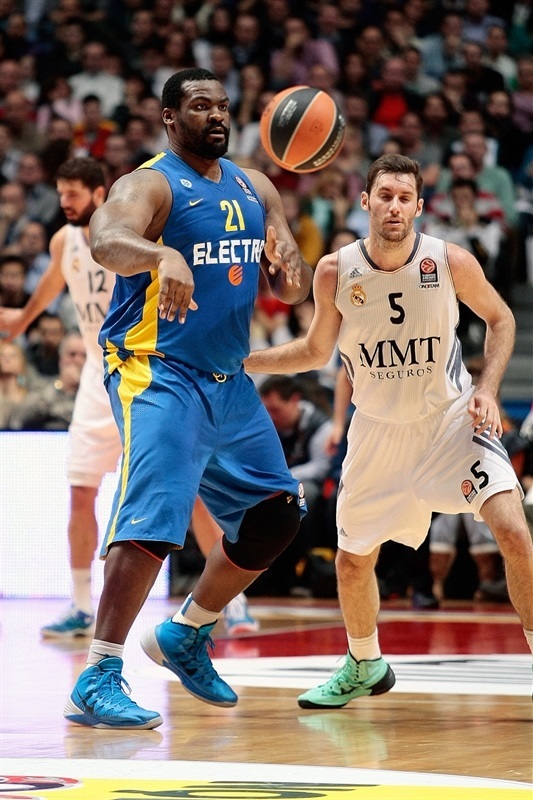 Schortsanitis made free throws, but Llull struck again from downtown to ignite the crowd at 72-68. An unstoppable Llull made free throws to seal the outcome, allowing Madrid to celebrate a big home win. 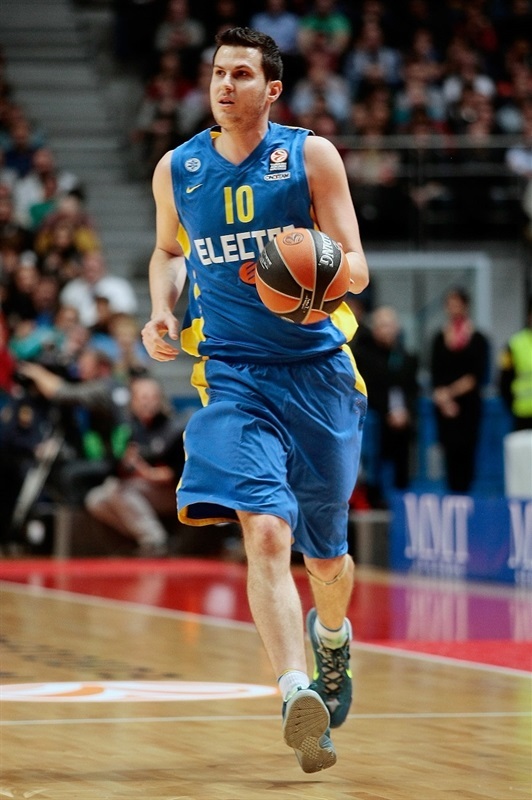 "All games are different and in this one, we had to adjust to what Maccabi demanded from us. At some point during the game we changed our defense and that made us take Maccabi out of the game for a few moments. We learned a lot from this game and can use it in the future. Real Madrid needs all of its players every day. For us, it is very important to have constant energy." "It was a great basketball game. Both teams played hard and played to win. In my mind - and I think that is everyone's mind - Real Madrid has been the top team in Europe up to this point. Particularly at home, they have been dominant. Our objective was to control the tempo of the game and to bring the game down to the final minutes with us in it. The funny thing is that we succeeded very much on that and then in the very last few minutes we lost our way a little bit, largely because of the good play of Real Madrid. I think that Coach Laso has done a tremendous job everywhere. 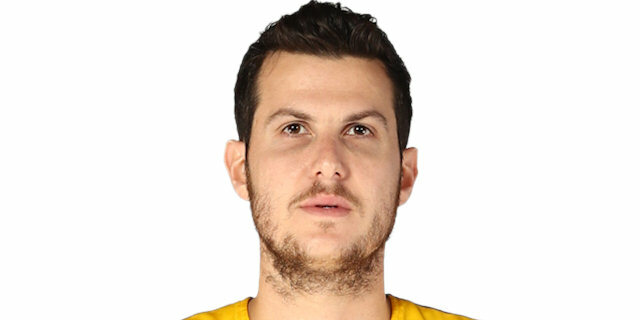 They play great basketball and are certainly worthy of the high esteem and reputation that they have right now in the Euroleague and in the Spanish League. It was a game that could have gone either way, but after 40 minutes of a basketball game, the best team won and we didn't. I am proud and happy of the way my players played." 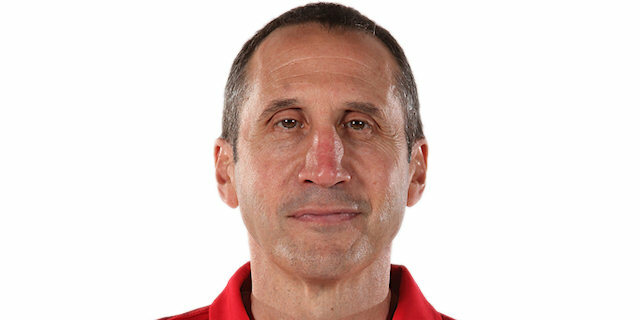 "It was a difficult game, but we improved our defense in the third and fourth quarters, which allowed us to run the floor. Our fans helped us a lot; they allowed us to rally and get another win. I cannot only score points, which is what everyone talks about, but I helped the team in as many aspects as I can, aspects that are also good for the team. They say you learn more from losses and we lost against a great team like CSKA. We came out with a lot of energy. It was a difficult game, but we got the win. We have four wins from five games in this Top 16, which is a good start for us." "It was an important game that we needed to win. Maccabi was undefeated in the Top 16, but we could not afford a home loss. I am happy with the win and above all, I want to thank our fans, who sold out Palacio de los Deportes. They push us to win games like this. We were aware that we couldn't win all the games in the season and lost against a great team like CSKA. We have to move on and carry on. Maccabi is always a tricky team on defense and managed to stop us during some moments of the game, but we managed to win." "We missed a great opportunity. We played according to our game plan and the game was in our hands, but a few mistakes at the end and some missed shots cost us the game and that’s very painful. Even so, I think we can still be proud. We played against the best and deepest team in the Euroleague; a team that crushes every team on its home court, and we were right there, playing them as equals without any fear. If we continue like this, good things will happen. I think that every Maccabi fan that saw us today can be proud. "